When the original WarioWare, Inc. was released for Game Boy Advance, it brought with it a fresh new genre all its own. 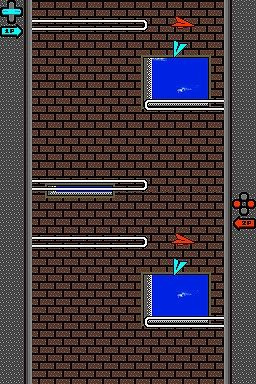 The concept of 'microgames' – a continual bombardment of shortened games that must be completed in a few seconds – has always been a trademark of the franchise. However, WarioWare also introduced to us a cluster of unlockable minigames – games that were geared towards more than a few seconds of play – that offered a refreshing change of pace from the frantic button-mashing of the microgame troupe. One of those games was Paper Plane. 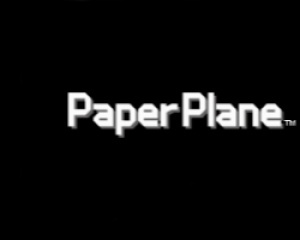 Once again, we are able to relive the fun of this classic game of gliding paper aircraft: this time as a standalone title. You're probably saying, "I already have the old WarioWare, so I don't need to download this!" Hold up for just a second; they've added a few new ways to play that just might interest you enough to buy a copy. In addition to the traditional 'Endless' mode, two new modes have been included – Time Trial and Race – which both add a selection of predefined courses, instead of the constantly-generated path in Endless. No matter which mode you play, the basic goal remains the same; namely, steer your plane through a winding maze inside a tall tower. The plane slowly drops down, and you must guide it between the walls that seem to plague the structure's interior; clip your plane against a wall and it tears into confetti, marking the end of your escapade. In Endless mode, the tower never ends; you just keep slowly gliding down until you crash, with your goal being to go down as many levels as you can before this happens. Sure, that's simple enough, but the physics of the aircraft must be influenced just right: if the plane points toward the left or right of the screen, it'll drop slowly, due to the added pressure against the bottom of the craft; and if the point starts to tip downwards, the plane will begin to pick up some speed – If you're not careful, you could nose-dive straight into a wall! Okay, so what's different about the new modes then? In Time Trial mode, your goal is to race as fast as you can down a pre-built course, with a goal at the very bottom. 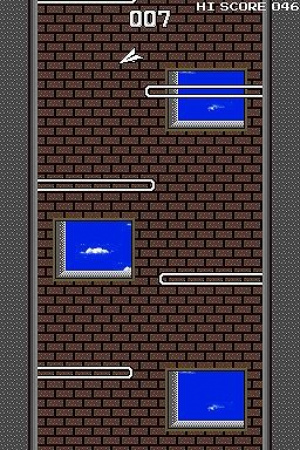 There are eight different courses to choose from (three of which require unlocking), and though they appear to be similar, they each have a different theme: ranging from thicker walls, to multiple tunnels, and even to pitch darkness! The rules remain the same as Endless mode when it comes to crashing; if you manage to collide with an obstacle, then the trial automatically ends in failure! One of the more creative of the new modes is VS, where you and a friend each control a plane in a race to the goal. Both players use the same DSi to play: Player 1 (blue) uses the D-Pad and top screen, while Player 2 (red) uses the buttons and bottom screen. The rules are simple: whoever crosses the goal first wins. However, there is a difference when somebody crashes in this mode: instead of dropping out of the race, their craft will respawn a couple of seconds after it was ripped to shreds – only causing a minor time penalty. The VS Mode does get awkward with two people holding one DSi, but it's good fun and also great practice for Time Trial, so there is value in playing it. Well, by now you should have made up your mind on this game: if you have Paper Plane already and don't need the extra modes to enjoy it, then by all means, don't buy it; but if you have it and would like to try the extra modes (or you don't have it and are curious), then this is one of the more compelling DSiWare titles out right now in the 200 points price range. It is rich with pick-up-and-play gameplay – a highly valued feature is any genre. We played it, we enjoyed it; maybe you will too. Great review Ryan! Glad to see this one was pretty good. I'm definitely getting this one after I'm done reviewing these two DSiWare titles I'm working on. I didn't much like the original of this. Even if I did, I wouldn't spend money on it. Looks kind of good. I may get this when I have some extra points to spend. I can't wait for Nintendo to release Dr. Wario and Jump Forever! Are "our" DSiWare games not in Japan available or why is there a TBA for Japan? What is with Dr. Mario? Not in Japan released till now? Haha we clarified the 200 point price thing! Also this is out in Japan to my knowledge, we'll just have to change our system to not show TBA, or bother to enter a date! Thanks for all the input guys. Wow, wasn't expecting that score from this game! But good to know. Cool, depending on you NLs other DSi reviews, I might get this. For only 200 points, it looks worth it. hmmm...I might get this one! I really hope we see Jump Forever and Skating Board from it sometime as well, those two are easily my favourites. I spotted a typo in the 2nd paragraph: Hold up for just a second; they've added a few new ways to play that just might interest you enough to but a copy. Hmmm.. I may need to look at this further. The review certainly outlined that this game isn't worth a simple skip just because on first glance it may not seem worth it, especially for WarioWare veterans like myself, so for that I thank you. Looks cool. I for one have never played the original WarioWare, so I didn't get to experience this or Pyoro. I'm glad this has turned out to be good. However, I'm not going to get right now as I am not with pyoro. Maybe I will when the dsiware well runs a little dry some time in the future. Well, now that they're re-releasing these old minigames, I doubt there's a chance of a VH re-release of the original WarioWare now! Cool! 200 points for what sounds to be an addictive game! But where can I get a Nintendo Points card from? It's finally arrived in the US!!! Nice review for another good DSi Ware game! This is the best DSi download so far. It's simple and not very flashy, but it keeps you coming back for more! This game is very fun and addicting. I highly recommend it for those of you who like fun mindless games! My high score on endless mode is 190. Wasn't expecting such a high score for this. I enjoyed the original "Paper Plane" mini-game on the GBA "WarioWare inc.", so I'll most likely get this... The multiplayer sounds really good though! Great review! ya totly. my high score is 262. You just can't put this game down it is soooo addicting, and it deserves a 9/10.It is packed with content compared to other 200 point titles. It has Multiplayer, Time Trail, and Endless Mode and all of them are are loaded with detail and content. This is the reason we love Nintendo. Hrm, I must admit it seems you can do quite a bit on this game, but it still seems a little bit too simple for me.... Is Paper Plane on any of the minigames on WarioWare Touched! ? More importantly, is this game worth it? Are there any good adventure games on DSiWare? I like lengthy games, especially platformers and adventurers. I got this, it's pretty addictive, but yeah, a little boring after a while, especially since I keep finding ways on dying pretty early in the game..... (Currently my highscore is only 217, yeah, yeah, I know, LAME....) But the fact it shows WarioWare characters through the windows is great. Wait wait wait wait, NP (now PureGamer) reviewed this? This is bending my mind in all kinds of ways. I got this a while ago . . . and after 10 minutes, I wanted my 2 bucks back. I love this game! ITS AN 8/10! Different review websites say this game isn't all that great. It's hard to know which is right or wrong.